Happy Hunger Games! And may the odds be ever in your favor! Tonight, I am going to attend the midnight premier of Hunger Games with a few dozen friends and coworkers. Some of them are huge fans of the books. Some of them are guys who just want to see a movie where lots of people die. Some of us have t-shirts painted with Jennifer Lawrence's face. 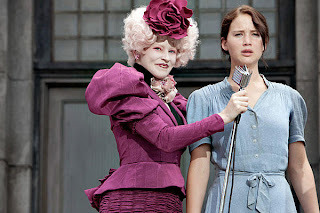 Others are dressing up like Effie - plenty of pink, high heels, funky socks, excessive makeup. A few friends have promised to bring beer and pizza, a kind of pre- Hunger Games party. We have blankets and snacks and a massive stack of movie tickets to sell off in case some of our group doesn't make it. We've been planning this night for months. But it wasn't until last night that I realized something a little disturbing. Drowning in privilege, eating and drinking on the eve of a physically and emotionally violent phenomenon... I am a member of District 1. Now, I know that this book is fiction. I know that we're not literally watching people die while munching popcorn. But I do think it's important to fully grasp the implications of Suzanne Collins' bestselling trilogy. Panem is a world ruled by a single dictator, who lives in a district that utterly ignores the poverty and suffering of the cities around it. The people in District 1 have so much food that they vomit after each course to "make room." They are more interested in fashion and gossip than the misery of their fellow Panem citizens. And in some ways, it's not their fault; they are encased in a pretty, shiny world that doesn't allow them to see what's happening outside. America is not District 1...But we could be. And I think that's the point Suzanne Collins was trying to make. Books awaken us to things in ourselves that we could not have seen otherwise. Today, on the eve of The Hunger Games' release date, be awake. Understand your privilege. You ate breakfast today. You live in a house. You have access to internet, newspapers, books, DVDs. You are literate. You drink clean water. Water. So many people in this world don't even have that. Use your privilege. And I don't mean this in a self-gratifying, pompous way; don't throw your privilege at people as if your money and resources can save them. I mean use it. Learn about the world. Write. Read. Travel. Find a cause or a charity that you love and join it, if you can. Be kind. Keep an open mind. Pray.Think. And lastly, be grateful for your privilege. Don't be ashamed. You are blessed. Accept that fact, savor it, understand it, and respond. I was talking about this last night with my husband and kids. How many of us think about how really fortunate we are on a daily basis? Its so easy to take it all for granted. How lucky are we to be born in this country? Its amazing if you really think about it. I am taking my three oldest kids to the 12:30am showing tonight. The others were all filled up before I could get tickets! We are so lucky, because the kids are out of school tomorrow! So it will be a great family event. They've all read the books, so they are as pumped as I am! This is the best post I've read on this blog, well done! You make some very good points, inspiring, thank you :-) You've definitely given me something to think about. What a wonderful post, and an excellent point to make. Thank you! Me too! I'm going to the midnight showing. Have had my tickets for a while. I have a group too. We do midnight showings, sadly this group is smaller than the others (dang work) but we always have chairs, food, drinks, and games to do before the movie. I have my mocingjay pin! 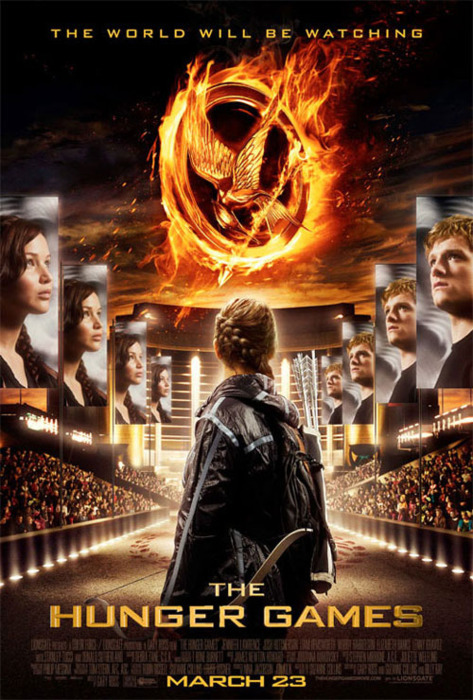 A quibble: District 1 is not the Capitol. Great post, but I have to agree with Anonymous. District 1 is different from the Capitol. District 1 makes luxury goods. As I've been rereading the trilogy, I've thought these same things. I put the book down one night this week and snuggled into my warm comforter while it snowed outside and thought, man I'm lucky! Excellent post. I'm ready to be a mockingjay. Books like The Hunger Games and The Book Thief definitely have made me aware of the things I'm grateful to have--and the things I'm grateful to not have to go through. Right? Our country isn't bombing certain states/regions out of existence. Yet. ;) But reflecting on how thankful we are for what we have is not the same as using your privilege. 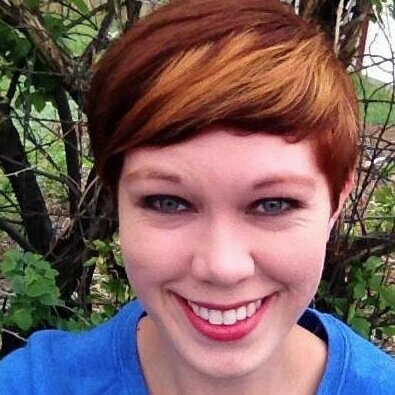 Thanks for addressing this, Kristin! That's a very interesting view. You don't think about things until they're not there. Like I live in Japan, and I didn't think about stable land until last year when there were 20-100 earthquakes a day. Also: China Glaze releasing nail polish based on each District. Basing fashion choices off favorite tributes or romanticization of the Districts? HMMMMMM. Yes! I found that incredibly ironic. Great post. To me it's more than just recognizing our privilege. It's recognizing that we regularly experience other people's suffering and misfortune as gossip and entertainment. COPS, JERRY SPRINGER etc, FIRST 48, HOARDERS, INTERVENTION. Feel me? I think about this all the time, and how ridiculous we must seem to people who have nothing. The things we complain are missing in our lives are trivial in comparison to what necessities other really are missing in their lives. Great post! Oh my gosh! I totally never thought about us like that before but you're so right! And I bet Suzanne Collins intended that. I guess I got so caught up in "how amazing the book is" and how it's such a scary different future that America could possibly become, that I never really compared myself to the situation in the book and how Katniss lives in poverty and I have so much- just like the Capitol. Today we were perhaps 200,000 people in the streets of my city (Montreal) to protest against a system which, even within our "rich" societies, wants to take more money from the poor and give more to the rich. Today, 200,000 people reclaimed their privilege (living in a "democracy", I guess) to make the world a better place! There is hope for us yet. That's wonderful! Yes, even within our "privileged" world, there are plenty of people who go without...including so many people in my city. I'm just grateful that I have *enough*, and grateful that I live in a society where we can legally protest the imbalance of privilege. I haven't read the books (I know, I know...). I do, however, work with low-income families. In the United States. People who don't have homes or sufficient clothes or even meals at times. How ironic my friends and I were just discussing this the other day. One of posted a picture on Twitter that said, "If I'm excited for the Hunger Games...does that mean I'm from The Capitol?" It really makes you think. I've been counting down to this day for weeks, but in the back of my mind, I wondered if I was just like the Capitol, counting down the days until the Hunger Games. But, I just shake it off and tell myself it's not real. Yes! Yes! Yes! This is something I have thought about a lot. I also found it eerily ironic that in the Capitol, they only cared about the romance between Peeta and Katniss, not all the deaths that just occurred, and while we were waiting for Mockingjay to release, people were Team Gale or Team Peeta--which was so not the point of the story. Great post! This is exactly why I love the Hunger Games. By the standards of the US government, I live below the poverty line. I still had a lot to be happy about -- loving family, health, food to eat -- but The Hunger Games made me look at my world different. There's grass and bushes -- luxury plants -- outside my apartment complex. I have access to the internet and the library. I'm poor for someone who lives in the Capitol, but I have *so many* luxuries in my life, even though I usually don't think of them as luxuries. I'm a happier, more grateful person for Collin's books, and more ready to look for ways to help others. We were talking about that last week. My friends and I were planning our outfits and hair color choices...and we felt like the Capitol. Wonderful post!